Your bridesmaid dress is FAB. can I see a picture of the whole thing? Sure. I'll try to upload one right now. Basically, here's how it went down: My friend Camella had her dress custom-made by Lorna Leedy of Fancy Pony Land who does amazing vinyl applique. Camella asked all of the bridesmaids to buy white dresses and send them to Lorna to do a little applique. However, that was going to cost $100, so I opted to try it myself. Cutting the vinyl was actually much easier than I anticipated (I had only ever worked with cottony fabrics before). I just wish I would have glued it (or something) first because it kept slipping around. Sorry, my hands are kind of covering it. That's the best picture I've got! That wedding dress is unbelievable! I'm loving it. Your bm's dress is super cute too, how handy are you?! While my dress didn't cost $38, it did only cost $131. 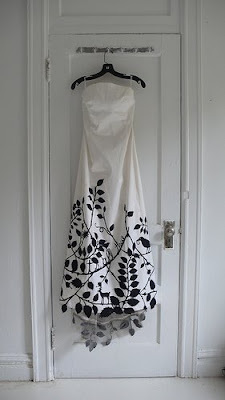 It's a bridesmaids dress, and my friend (who is a designer) is going to spruce it up for me. She'll be embellishing it with fireworks along the base of the dress (I have them tattooed on my back) and some embellishments in the center of the chest. It's such an honor to be able to say "One of my dearest friends made my dress beautiful." That's something worth passing along to my daughter. Wow..! What a beautiful wedding dress. I love it.